One of the recurring concerns in debates over taxation is of the ‘race to the bottom’. It is alleged that cuts in tax rates in one jurisdiction will force cuts in other jurisdictions. This relates more to so-called mobile factors, such as financial capital. It is relatively quick and easy for money to cross borders nowadays. It can be sent to where taxation is lowest. Labor, by contrast, has a harder time crossing borders so is less responsive to tax changes, at least in terms of its location. Is this ‘race to the bottom’ happening US states? Economists Robert S. Chirinko and Daniel J. Wilson examine that question in a recent paper, Tax Competition among U.S. States: Racing to the Bottom or Riding on a Seesaw?. Surprisingly, perhaps, they find that “the slope of the reaction function – the equilibrium response of home state tax policy to foreign state tax policy – is negative”. In other words, the equilibrium response of home state tax policy to foreign state tax policy is to go in the opposite direction. The authors quote Wisconsin’s governor Scott Walker from 2011, saying “Wisconsin is open for business. In these challenging economic times while Illinois is raising taxes, we are lowering them”. Our findings suggest that the dramatic declines in state capital taxation in recent decades are not driven by tax competition among states, but rather from aggregate shocks such as changes in tax rates and input costs abroad, U.S. macroeconomic conditions, the capital income share, and technology. These factors impact all states simultaneously, though their importance may vary by state. Rather than states “racing to the bottom” (a competitive response of tax rates in the same direction), our results suggest that state tax competition is better characterized by states “riding on a seesaw” (a competitive response in the opposite direction). An important implication of this result is that calls for legislative, judicial, or regulatory actions aimed at restricting tax competition as a means of stemming the fall in state capital tax revenue or the mobility of capital are likely misguided…If aggregate shocks, not tax competition, are driving the secular trends in capital taxation, both in the U.S. and Europe, public policies attenuating tax competition will do little to stop or reverse these trends. This is a potentially important finding for state tax policy. It is all too easy to focus on our state when looking at these issues. We might look at other states around the country. But in a globalizing world, we need to look beyond the US. Financial capital can move between Minneapolis and London with little more difficulty than it can between Minneapolis and Chicago. 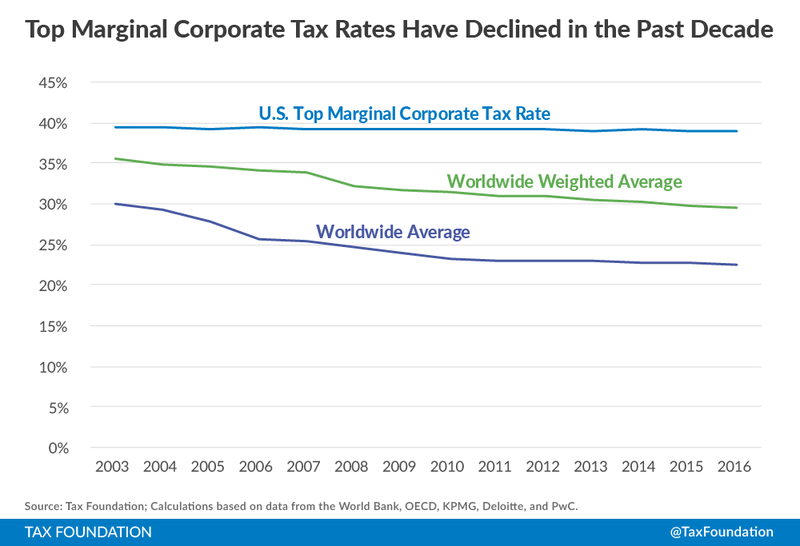 And, as the chart below shows, corporate tax rates have been trending downwards around the world. When making decisions in St Paul, policymakers need to look not just nationally, but internationally.